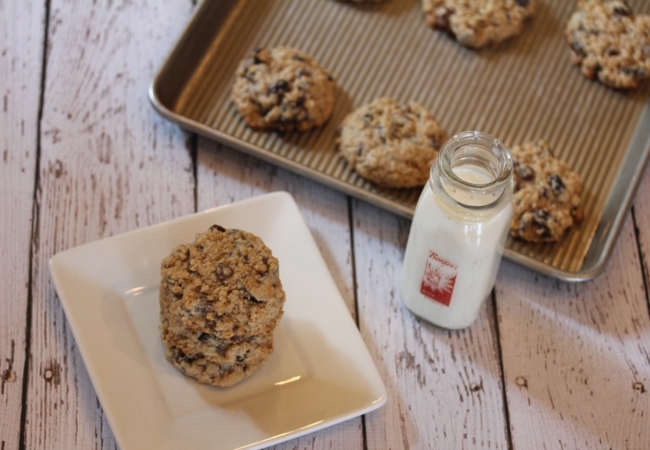 These chewy and delicious oatmeal cookies are a treat your family will love. I love cookies. Any kind of cookies. They have always been my favorite dessert to make and to eat. It has been awhile since I shared a cookie recipe with you, so I am excited to have a new cookie recipe for you today. Some oatmeal cookies are a basic cookie with a little oatmeal added. These are not that kind of cookie. 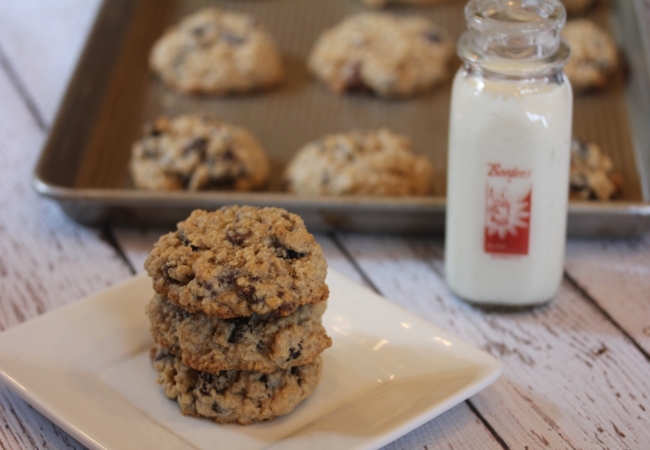 These are a hearty thick and full of oatmeal cookie. 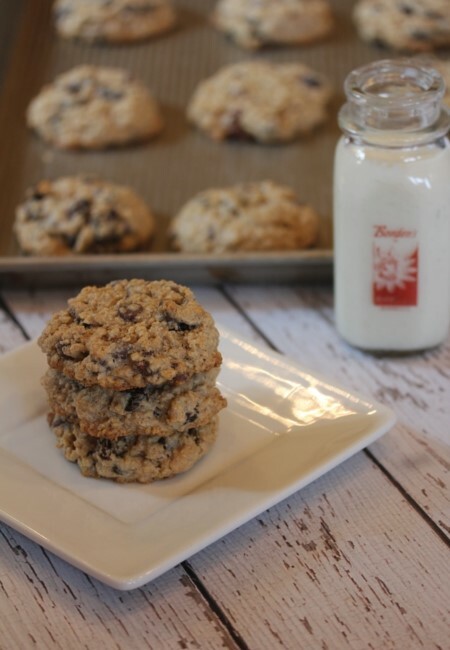 These are great on their own for just a plain oatmeal cookie, but we love them with raisins or chocolate chips added. A combination of both is even better. These cookies are flourless, which is great because if you use gluten free oats they are an easy gluten free dessert. In a blender or food processor grind 2 cups of the oatmeal until fine. In a bowl combine ground oats, remaining oatmeal, cornstarch, cinnamon, baking powder, and salt. Set aside. In a large mixing bowl cream butter and sugars until light and fluffy. Sit in chocolate chips and raisins. Drop by the spoonful onto cookie sheet. Bake 12-13 minutes or until edges are lightly browned. Can’t wait to try these. If I don’t want to use Chocolate chips do I need to double the raisins or just leave it as is minus the chocolate chips? This is one of those recipes that I think you can really add what you want for the raisins and chocolate chips. I use about 1 1/2 cups raisins when I make the raisin version, but if you could use a full 2 cups as well. If you just want a few raisins use 1 cup. You might start with 1 cup and stir them in and see what you think of the batter and add more if you want. I hope you enjoy them! can’t wait to try these. Thank you! Could you let me know what the measurement is for the cinnamon please? Was just about to make these and am guessing it’s either 1 tsp or 1T. It is 1 teaspoon. Sorry about that. I just fixed it in the recipe.